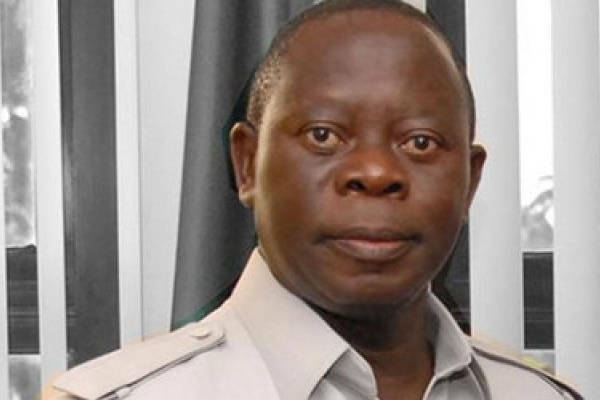 The National Chairman of the All Progressives Congress(APC), Adams Oshiomhole, was on Monday pelted with stones by hoodlums during the presidential rally that held in Abeokuta. The rally, which commenced officially immediately after President Muhammadu Buhari arrived the MKO Abiola International Stadium, Kuto, Abeokuta, was paused for some minutes following the violence. Violence erupted at the stadium when Oshiomhole was invited to the podium for his speech. As he started speaking, hoodlums started throwing stones at him and one of the stones flew in the direction where President Buhari was sitting. One of the security operatives took the hit for the President. Former Governor of Lagos State, Bola Tinubu, left the podium while the President was making his remarks.